Home › SFX 2018 › Admin Bot › Could you use a hand? Hello world! 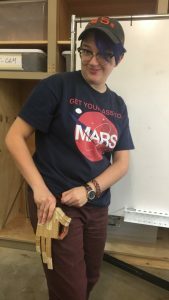 My name is Alex Jereb and I am the fabrication lead for the Admin Robot team. 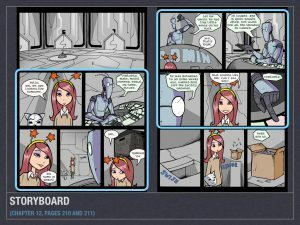 Our mission is to create a robot who is handsome, charming, and capable of making all of the movements in our storyboard pulled from the source comic, Gunnerkrigg Court by Tom Siddell. While initially I was eager to try and make him an animatronic, my team and I quickly realized that was not going to be possible with our budget. Instead, we decided to use puppetry techniques to give him a range of motion. 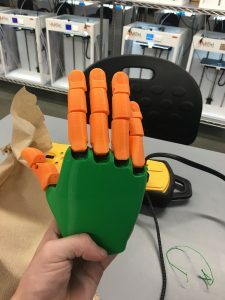 Our first prototype centered around his hands. For those of you familiar with anatomy, you know that muscles in our bodies exist in pairs. These pairs of muscles, such as the biceps and triceps, take turns contracting, or pulling, in order to extend and contract your limbs, including your fingers. 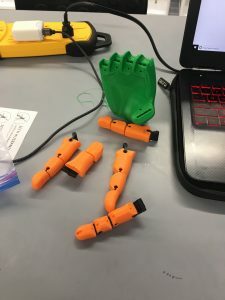 With this in mind, creating an artificial hand is a little bit simpler. You need the ability to contract the fingers and the ability to re-extend them. My team and I made a very quick proof of concept with cardboard, rubber bands, straws, and string. When you pull the string connected to the tip of a finger through the straw guides, it bends the cardboard along pre-bent joints. The springiness of the cardboard and the rubber bands running along the back allow for a positive return action of the finger, meaning it springs back when you release tension on the string. While the rest of the Admin Bot team and I still have a long way to go in making our boy, we couldn’t be more excited to embark on this journey. We hope to show you lots of cool things along the way and our boy in action after we start filming on Nov. 12th!